The 2017 UAE Business Awards Winners Announced! DUBAI, United Arab Emirates, 28th May 2017 — Knowledge E is privileged to receive twin awards from UAE Business Awards 2017. The Awards is designed to celebrate the talent that has provided some of the best products and services in one of the largest influential business regions from across the globe. 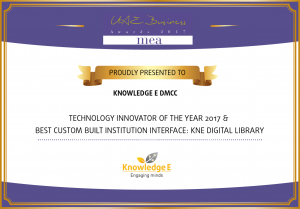 To receive the award in the category of “Technology Innovator of the year 2017” and “Best custom built institution interface: KNE Digital Library” is recognition of our excellent commitment to the education and publishing industry in developing world class product and services. Knowledge E was established in 2012 and has quickly become synonymous with collaboration, innovation and progression. Based in Dubai, UAE, at the centre of a region of vision and ambition, Knowledge E works passionately with all types of organisations and government entities within research and education to support their continued innovation and development by providing them with leading expertise, information resources and software solutions. This includes the KnE Digital Library for research literature discovery and the KnE Publishing Platform for open access journal and conference proceedings publishing and indexing, along with associated research and publishing services for capacity building within academia.